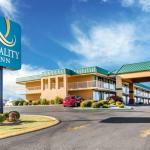 Microwaves and mini-fridges are standard free breakfast is served daily and high-speed internet access is available at Quality Inn Dyersburg. Guests enjoy a complimentary breakfast that includes sausage eggs and waffles at this two-story hotel. All 54 rooms have microwaves mini-fridges and coffeemakers; non-smoking rooms are available. Access to a local fitness center is offered. Take a swim in the seasonal outdoor pool or get some work done with high-speed internet access. The hotel provides a coin laundry. Parking is available for vehicles of all sizes. Dyersburg State Community College is one-and-a-half miles from this hotel which is located off I-155. Try your luck at Lady Luck Casino 21 miles away or have some outdoor fun at Reelfoot Lake State Park 26 miles away. Graceland is a one-and-a-half-hour drive. It's 49 miles to McKellar-Sipes Regional Airport and 87 miles to Memphis International Airport.